I’m sure we all do it. Everyday. A million little shortcuts, tricks, helpful handy deeds in the kitchen. I stopped for a minute to see if I can catch a few of them speeding by. You know…they just happen. You forget you even do them. Try to take note of your handy-dandy kitchen deeds. Let me know yours. We can trade. 1. Preserve your green delicates longer. 2. Magically use less olive oil. A lot of the time we want to drizzle olive oil. Not POUR it. 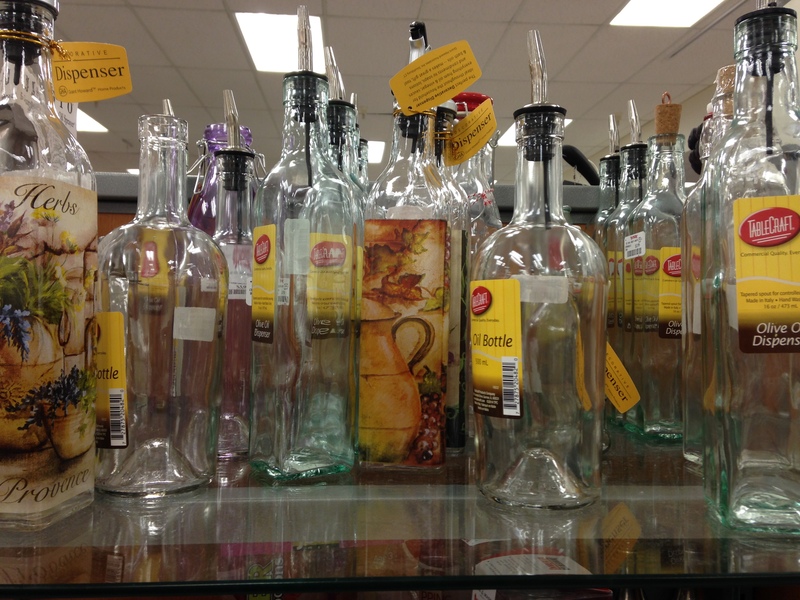 The large pour spouts in most store-bought bottles are pretty wide. So you get a river when you really want a steady creek. 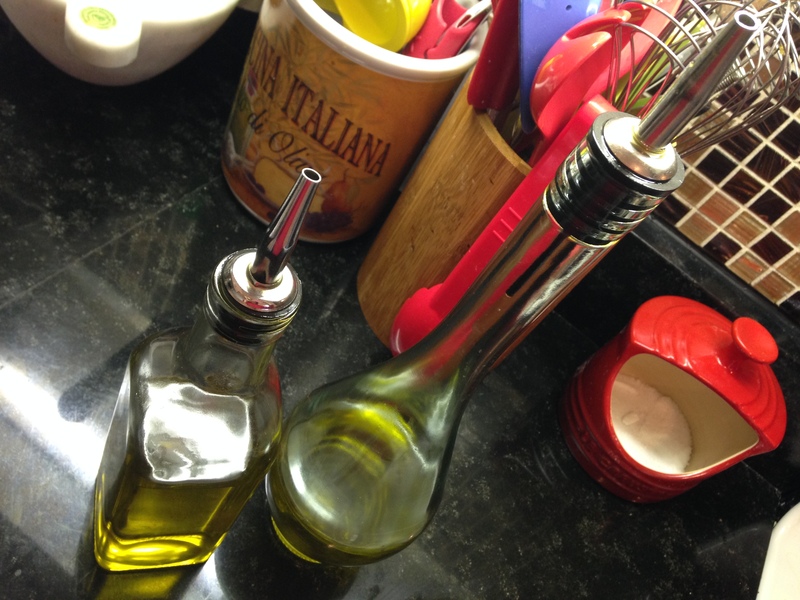 Those pretty olive oil decanter bottles you see all the time solve this asap (Trader Joe has millions of them). Pour spouts might vary from one to the next. Some thinner than a drizzle; others just drizzle. So I keep two bottles. One pours faster than the other. I grab the faster one to coat a sauté pan. And the slower-pour for drizzling on top of food. 3. Slice shrimp in half for MORE SHRIMP. Oh so tricky. I love this. 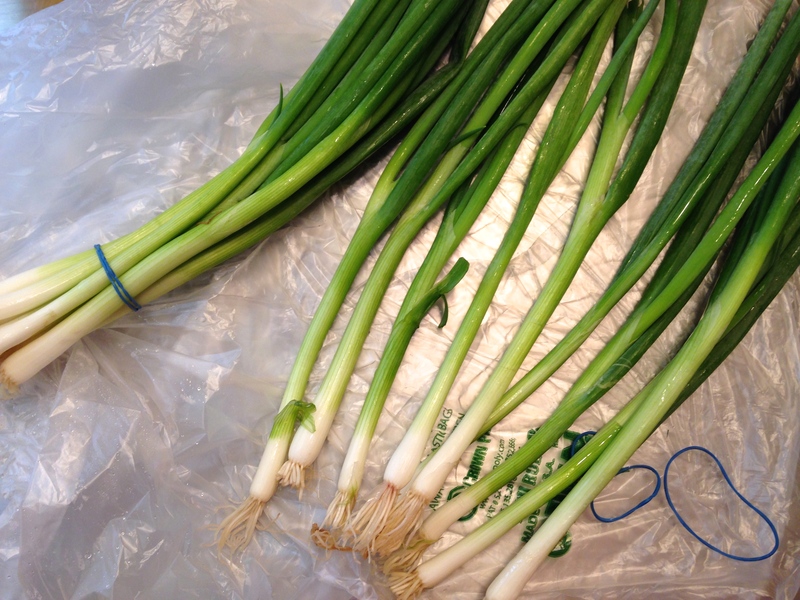 Slice them in half lengthwise. Then add them to your dish (sauce? sauté? shrimp cocktail?). Half of a shrimp is just as satisfying to pop in your mouth as a whole shrimp. 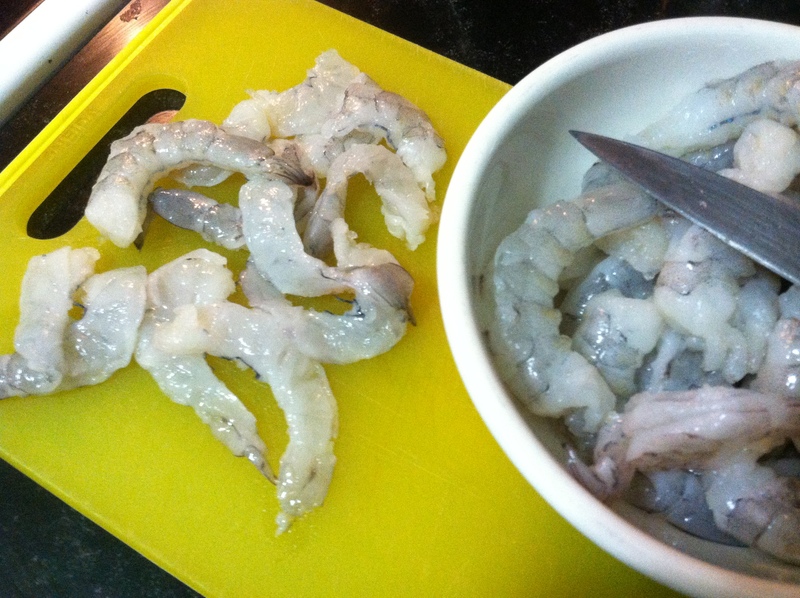 So you get to multiply them, distributing more shrimp pieces throughout your dish. Ain’t it the truth. 4. Scissors. The hidden hero in the kitchen. Quick and easy. Snip snip snip. 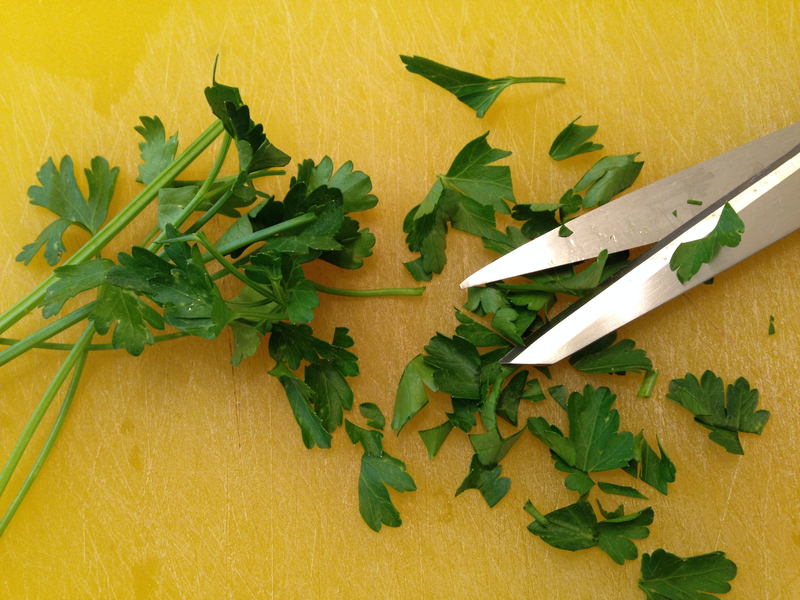 Fast-minced parsley. Or almost anything. There’s an ease and child-like play to using scissors. Like you’re getting away with something. Like it’s not supposed to be so easy. I cut sausage, butter, cooked spaghetti, pizza. Any other ideas? 5. 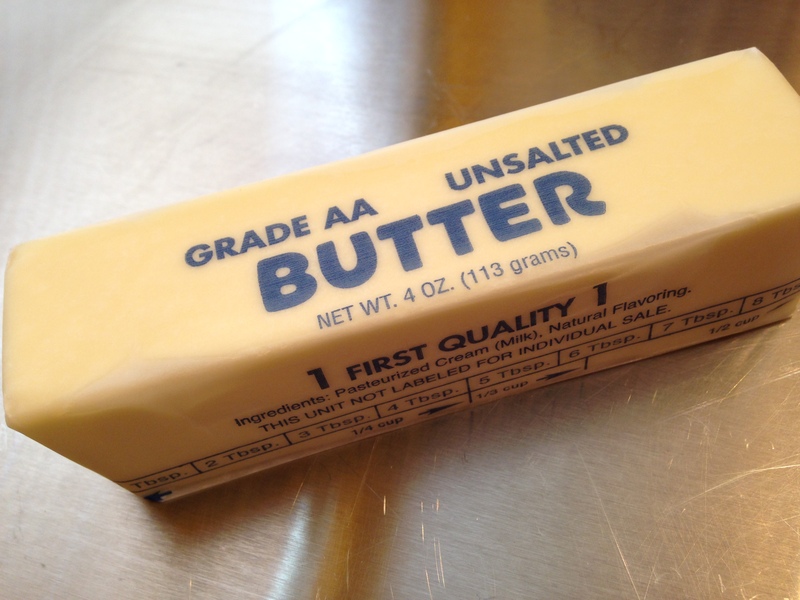 Soft butter takes time. I leave it out overnight. It’s ready in the morning when I want to bake. And it doesn’t mind leaving its refrigerated home for a dark evening on the kitchen counter. In fact, that stick of butter is on an adventure. It knows what’s coming and can dream about it all night. Transformation into the butterfly of a cake (or some other luscious starring role). 6. 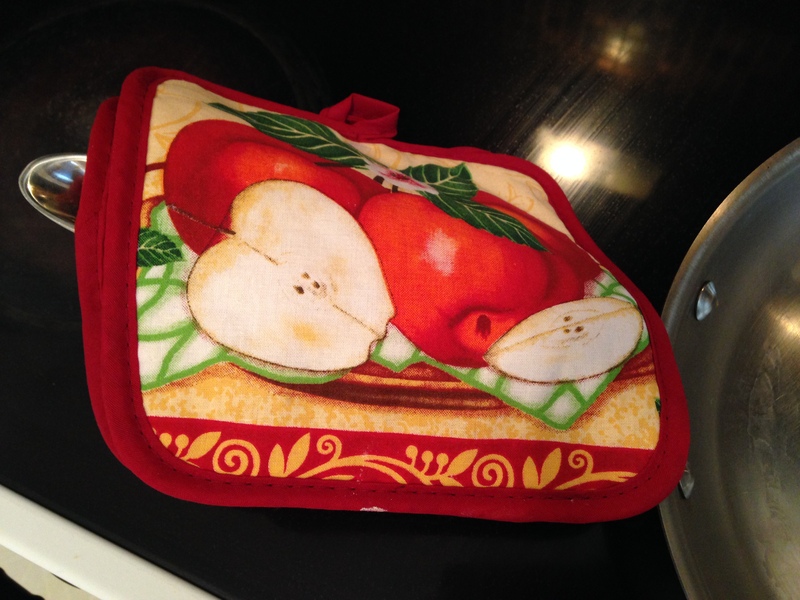 Stop your cutting board from running away. Chasing your board around the table while your hand is busily chopping with a knife is probably not a great way to come up with more ingredients for your new inventive dish. Place a damp paper towel under the board. Keeps it from moving. 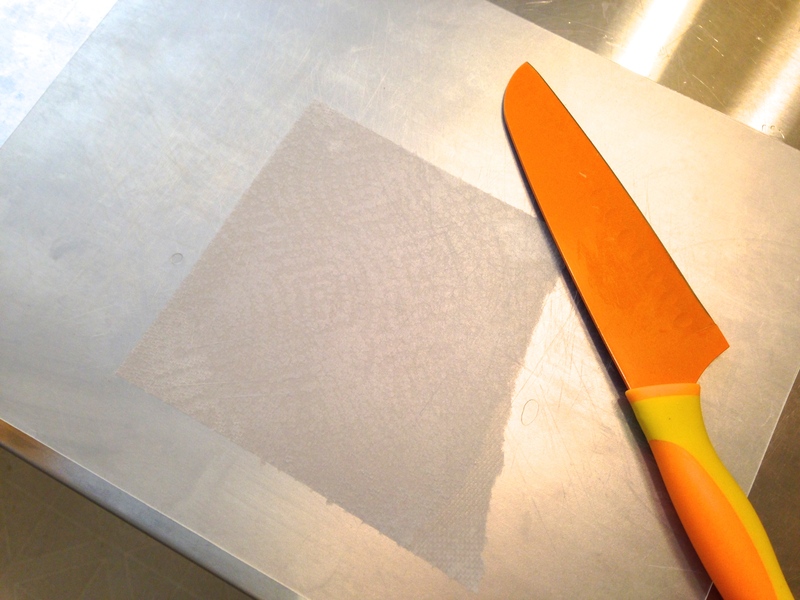 The photo shows a transparent (yet opaque) plastic cutting board with a square of wet paper towel under it. But same tip works for wood, heavy plastic, etc. 7. Another way to avoid burns. 8. Put some salt in the cellar. We’re always shaking salt from a salt shaker. It’s a nice way to get a gentle sprinkle on food. (And I am certainly a salter while cooking.) But what about when you need a teaspoon of salt? Or a tablespoon? 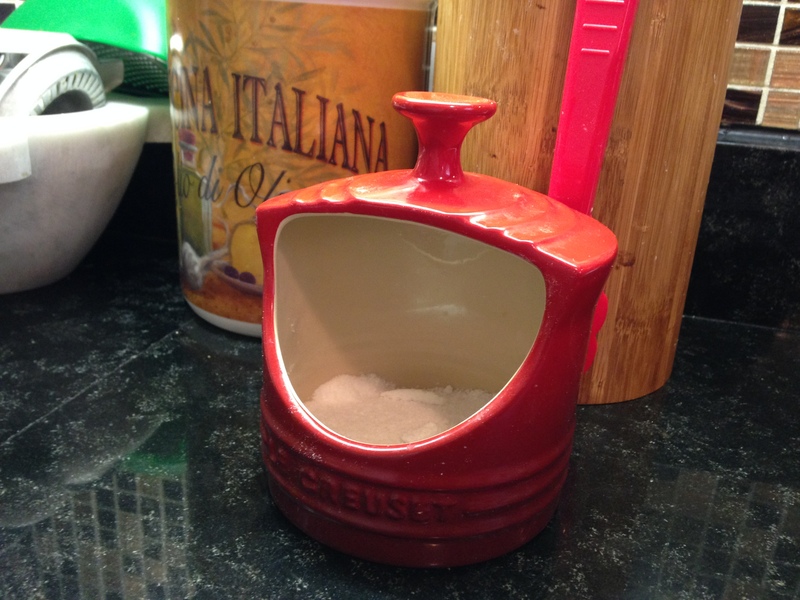 Or when you need a “healthy pinch?” Hence, the salt cellar. It’s at the ready with a small vat of salt for you to poke into. Years ago when I first became fascinated with salt cellars I searched for the perfect one (accumulating non-perfect ones, too). 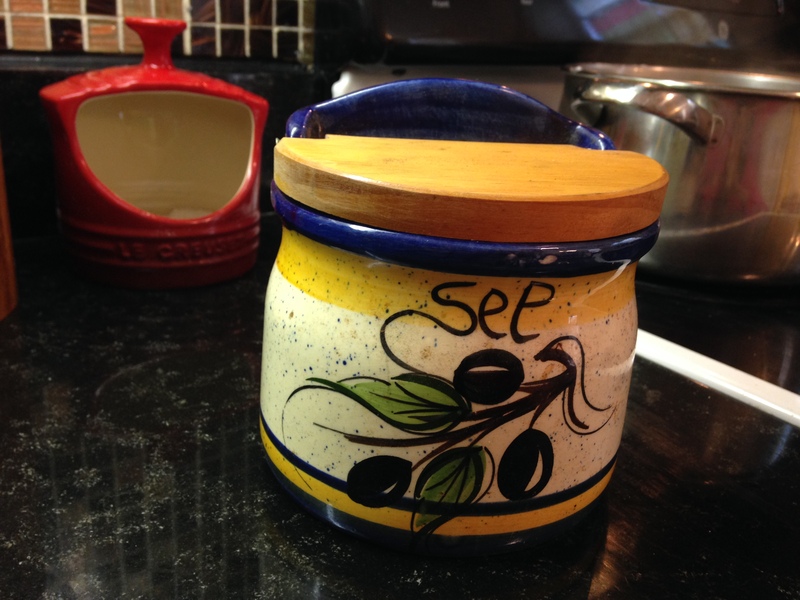 I’ve since lost many from that collection but, in addition to my everyday Le Creuset salt cellar bought at TJ Maxx for a bargain, I still have one that I bought at a Paris flea market. It’s got a hinged wooden door on top so your salt is safe from falling sugar, or fruit flies, or dust, or excited spattering stovetop oil. Now I use that one to store tea bags. 9. 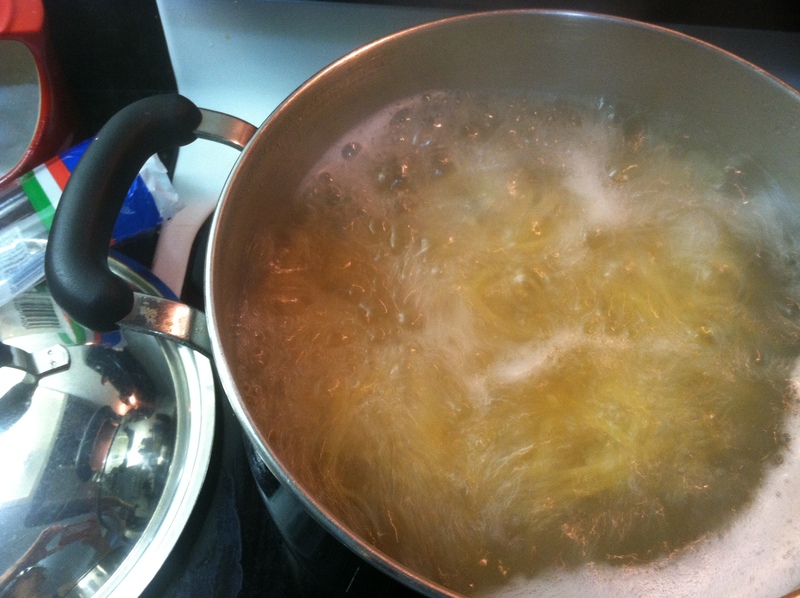 In the pasta pot: oil and water don’t mix. 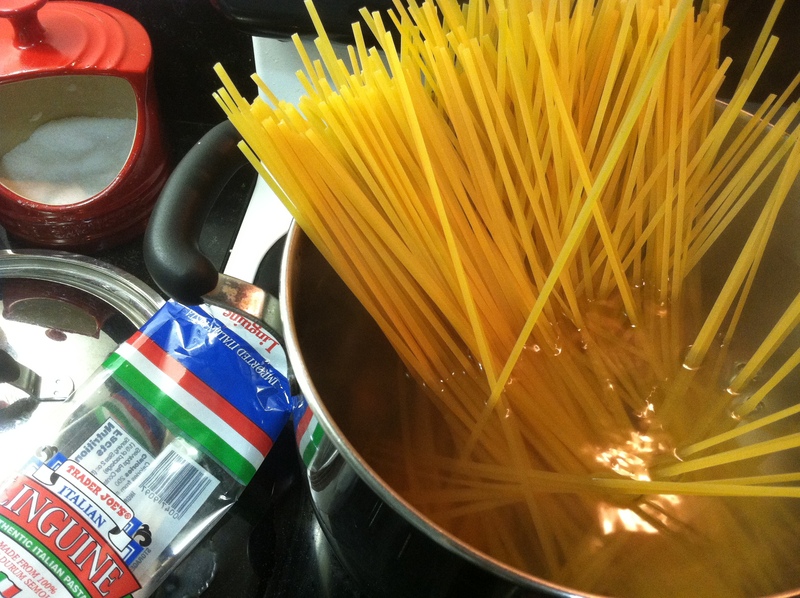 I hold the whole bunch in my hand over the center of the boiling water and place the spaghetti upright into the center. The strands will splay more evenly to the sides that way. Then right away get a long wooden fork (or longest fork you have) and poke into the strands, spinning them like you would if you were eating them. Poke in different places and spin to loosen them from each other. This gets easier to do once the noodles soften into the water. Keep poking and spinning now and then until the water comes back to a boil. Now the spaghetti will stay separated as it boils (and you can poke and spin a few more times before done). I just love this trick. 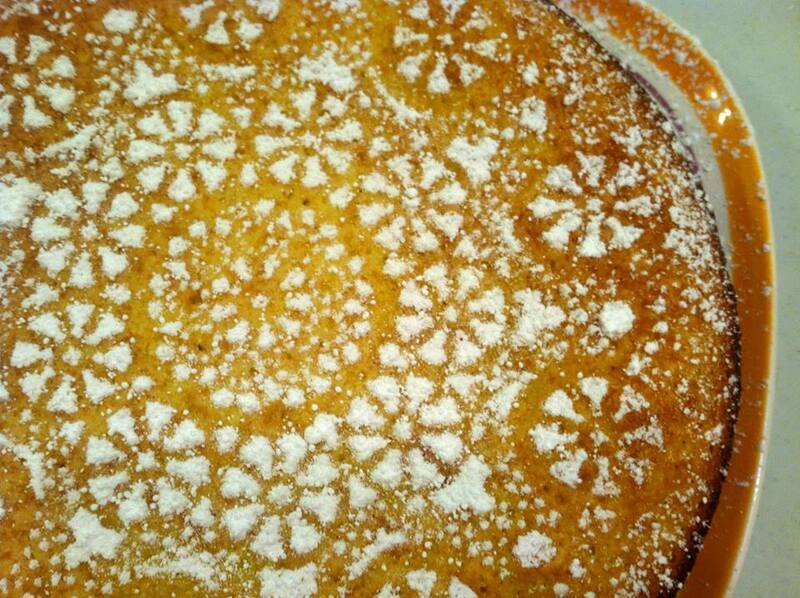 When your cake is done and cooled and you’re not going to ice it…just want to dust it with powdered sugar, first place a paper doily on top. 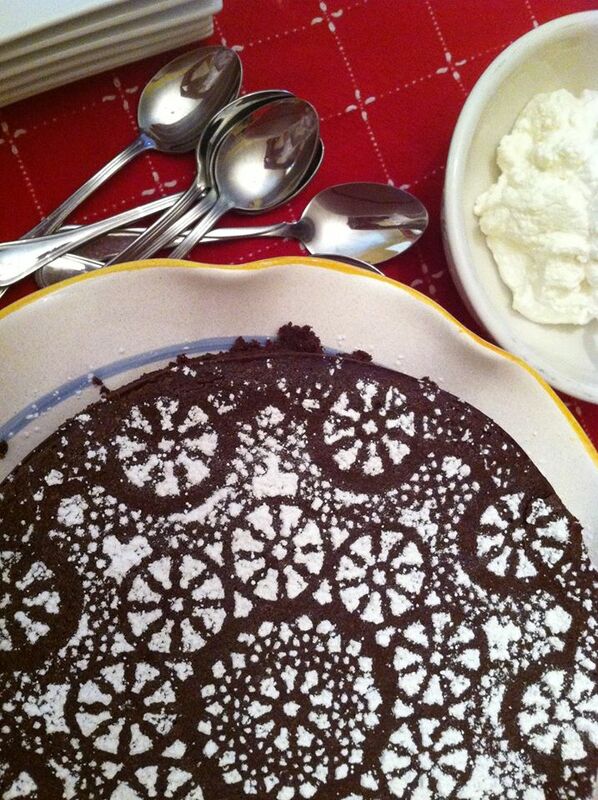 I use a small sieve with powdered sugar in it and tap it to dust the whole thing with a good layer of sugar. Then hold the doily with your fingertips on each side and lift straight up. Voila! I’ve done this in class and students LOVE it. One student came back the next time with a gift: a packet of plastic doilies with many shapes and designs — a Martha Stewart doily-pack. So you can re-use them. Stay tuned for more Hand-Dandy Deeds!